Merry Christmas from Bleep UK PLC. 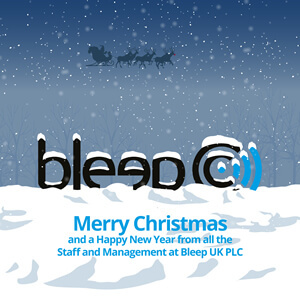 From everyone here at Bleep UK PLC, we would like to wish you a Merry Christmas and a Happy New Year. It has been a very memorable 2017 for Bleep UK PLC and we look forward to continuing our relationship into 2018 and beyond! We know your business does not stop over the festive period and rest assured, neither do we. Our offices are open as normal until Friday 22nd December and then usual hours resume on Tuesday 2nd January. To view full details of our Christmas Opening Hours, click here.